Don’t fall for the “Microsoft” tech support scam! This is of course completely fake. A scam. The people behind this expect that a certain percentage of people will call the number because they believe it really is Microsoft. In our experience, they’re right! 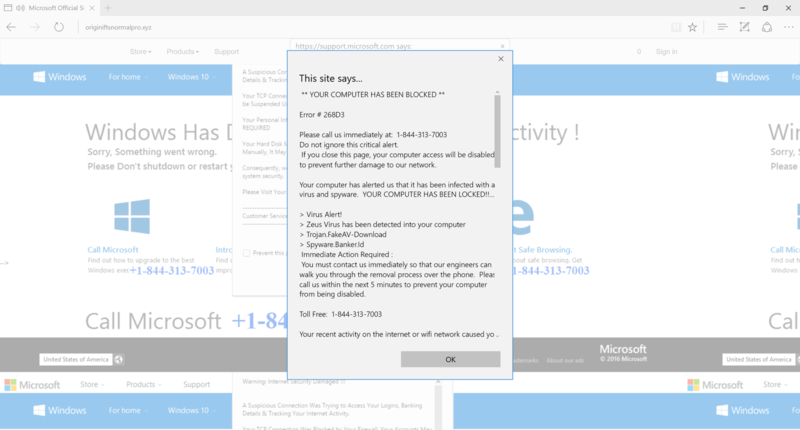 They’re using Microsoft logos, the Microsoft name, and most importantly, fear, to try to trick you into calling. If you call the number, the ball gets rolling. Even if you figure out that it’s a scam and hang up, the people running this despicable scam now have your phone number, and from what we have seen from our clients, they will call over and over again, giving you the telephone version of the same scam as above. If you do go along, they are going to ask you to install remote access software that will allow them to completely take over your computer, giving them the keys to the kingdom so to speak. While they are “cleaning” the infection your computer supposedly has, they are also harvesting any and all saved usernames and passwords on your computer! This can include banking information, Facebook usernames and passwords, saved credit card numbers, you name it. Finally, just to add insult to injury, they are going to lock you out of your own computer unless you pay what amounts to a ransom (usually $300 – $500) to get it back! Help, I Called, Now What!? Immediately shut down your computer! If it’s not powered on they can’t access it. Bring your computer in! We can save your important files, photos, documents, etc. and ensure that your computer is clean and safe to use again. Call us at (207) 621-0658, email us at support@comdoctor.net, or use our Contact Form to reach us today! Change all of your passwords. This includes email, any social media accounts you use such as Facebook and Instagram, etc. Even with an excellent popup blocker/ad blocker like uBlock Origin you may still encounter this. Don’t panic if you do! At this point it’s just another popup. Simply close all browser windows and continue on as normal. If you can’t close your browser (yes, sometimes this ugly little wart on the internet will prevent you from even doing that! ), you can always go to the nuclear option! Have you experienced this popup? Leave a comment below and tell us about your experience!